Vintage - Beautiful Winterling Pattern by Marktleuthen China of Bavaria. Produced in the early 1950"s. A (17) Piece Set. 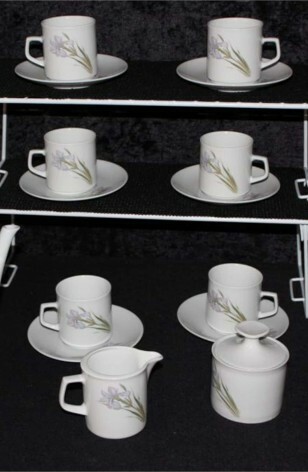 This is a Retro 1950's "Winterling" Marktleuthen Coffee/Tea Set, in a lovely Lavender Iris Pattern. The Pattern includes the Greenery Associated with the Iris, and the Shape of the Coffee/Tea Pot, Cups, Saucers, Sugar Bowl and Creamer are all in a Modern More Upright Style.